> Avaya > Digital Transformation: Insight into Getting it Right! 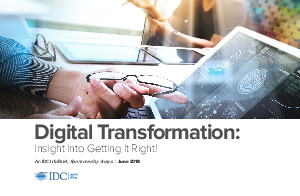 Digital Transformation: Insight into Getting it Right, is research commissioned by Avaya and undertaken by IDC. The Infobrief contains key insights from over 1,300 enterprises and consumers to help brands plan and improve digital transformation, specifically through the modernization of business communications infrastructure. Because business communications technology is at the heart of digital transformation.